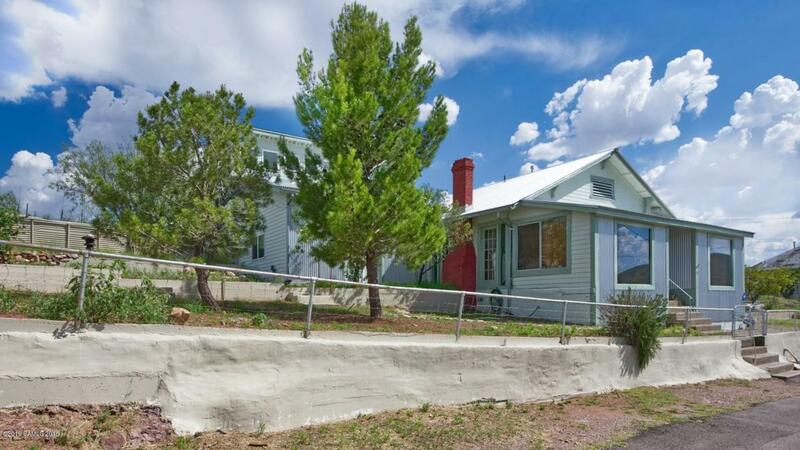 Your chance to own the historic Sieg home featured on the Bisbee Home Tour. This Old Bisbeey style home has the best views imaginable. Historical quality, uniquely infused w/ modern elements. Spacious dining area for gathering & sharing good times. Roomy kitchen w/ steel & butcher block counters. Studio/den offers privacy & an abundance of light, perfect for an art studio! Two enormous bedrooms, one on main level w/ niches for storage & an adjacent loft bedroom w/ room for sitting area or future bathroom. Gorgeous, modern updated bath. Rich wood floors. Heavy gauge steel siding & new roof are fire resistant & will last for years. Perfectly landscaped yard offers fruit trees, garden beds & room for outdoor living. Huge shed for projects & storage. Relaxing covered Trex deck ...See MoreRelaxing covered Trex deck off master bedroom is the perfect place for enjoying mountain and valley views. Updated in and out. New beams, cement board siding, NEW WIRING THROUGHOUT, 200 amp service, 2 x 6 construction, Low E windows, power to shed, water and sewer lines nearby for future connection if desired. Access to water and sewer lines off of upstairs bedroom for future connection if desired. LED lights inside and out. Prewired for A/C on power panel on wall outside of upper north wall. Parcel #101-11-150A also included for room to roam! Room for future building and parking. This home has been updated throughout. Serene and peaceful, perfect forever home!